Copyright 2001 - 2015 by Dr Jeanne Ohm. All rights reserved. The information on this site is the property of Dr. Ohm. No part of this document may be reproduced, stored in a retrieval system, or transmitted, in any form or by any means, electronic, mechanical, photocopying, recording or otherwise, without the prior written permission of the copyright owner. For more information contact Dr. Ohm at 610.891.1190 or send us an email. Dr. Jeanne Ohm provides this important information as a public service to assist health practitioners, parents and families in their most important roles. It is neither ethical nor responsible to use the internet for consultation about specific children or families. Any information obtained here is not to be construed as medical or legal advice. 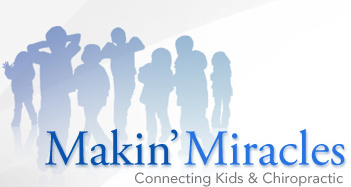 The health-related information which appears on the Makin’ Miracles website is presented for educational purposes only. Always consult your chiropractor, midwife, physician or child care expert if you have any questions concerning your, or your family's, well being. Dr. Jeanne Ohm takes no responsibility as to the accuracy of statements in any of our articles or Questions Answered segments -- we rely on the author of each article to present us with accurate and factual material. Dr. Jeanne Ohm presents all data as is, without any warranty of any kind, express or implied, and is not liable for its accuracy, for mistakes, errors, or omissions of any kind, nor for any loss or damage caused by a user's reliance on information obtained in the information. No rights can be derived from the texts on this site. Makin’ Miracles does not allow any messages to any interactive segment which are rude, offensive or derogatory to another visitor in any way. The messages written at interactive segments at Makin’ Miracles Website are the sole opinions of the individuals contributing them. They do not in any way express the opinions of Dr. Ohm. nor are they presented as facts. The Makin’ Miracles presents all information in interactive segments as is, without any warranty of any kind, express or implied, and is not liable for its accuracy, for mistakes, errors, or omissions of any kind, nor for any loss or damage caused by a user's reliance on information obtained in these areas. Dr. Ohm strongly urges each individual to respect the rules of decency and privacy. If you see any messages which you feel are offensive or inappropriate, please send an email and we will take immediate action.